Rebecca Menapace is the associate provost for innovation and the executive director of the Office of Technology Licensing. She is responsible for advancing the university’s academic mission of research excellence by pursuing strategic industry partnerships. 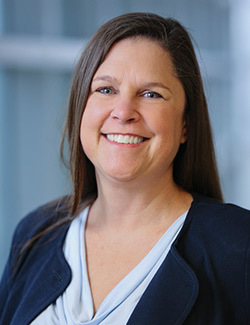 She supports science faculty, undergraduates, graduate students and postdoctoral fellows in commercializing their discoveries for the public benefit, and provides leadership and management for all of Brandeis’ intellectual property through the Office of Technology Licensing. Prior to Brandeis, Rebecca spent 12 years with Partners Healthcare as the director of research ventures and licensing, leading all intellectual-property, licensing and start-up development for Massachusetts General Hospital in Boston. She has also worked in corporate development, product management, applications engineering and research for a number of Boston-area biotechnology companies. Rebecca is a registered patent agent with the United States Patent and Trademark Office and is a named inventor on two U.S. patents. She holds a BA in biology with a concentration in chemistry from SUNY College at Oswego, and an MBA from the Northeastern University High Tech MBA program.